I first became aware of Haggai Segal about eight months ago after noticing a sniping tweet (similar to the one below) that was sent about him by another Israeli journalist to the tweeter feed of his son, the well-known TV reporter, Amit Segal. About a month ago, my curiosity about the elder Segal led me to obtain a copy of his book about the Jewish Underground. I also followed him on Twitter until a response I sent, referring to his past crimes, led Segal to block me. When reading his twitter feed, which was not all that active, I was surprised that even journalists from so-called left-wing outlets, like Barak Ravid, treated him with great respect and affection. What follows is some of what I learned about Israel’s terrorist journalist. In 1984 Haggai Segal was convicted of belonging to a terrorist organization, causing grievous harm, and possessing illegal firearms. Of the two bombs he planted, one blew off the foot of Karim Khalaf, the then mayor of Ramallah. A second, which was intended for the mayor of el Bireh, was discovered, but exploded when it was being deactivated, permanently blinding Suleiman Hirbawi, a Druze member of the Israeli Border Police. The Jewish Underground, as Segal’s gang came to be known, was also responsible for blowing off both legs of the mayor of Nablus, Bassam Shakaa. They attacked the Islamic College in Hebron, randomly killing three students and injuring 33 others. The Underground devoted much effort to developing a plan and stockpiling weapons, some stolen from the army, in a plot to blow up the Dome of the Rock. They hoped that destroying the holy Muslim shrine would somehow inspire Israel to rebuild a Jewish Temple in its stead. These are just the crimes we know about this gang carrying out over the course of at least five years of operation. Some of Segal’s co-conspirators were caught by police after planting five large bombs under five public buses in East Jerusalem. These bombs were set to explode at a time when they would have been full of Palestinian passengers. The explosives were deactivated by the General Security Services and arrests were made that led to the detention of other suspects including Segal. Segal was sentenced to five years imprisonment, but only served two. His already light sentence was reduced as were those of all the other members of the Underground, due to intense public and political pressure. It appears that many Israelis did not think of Segal’s actions as a crime. This is a sentiment echoed by his two sons, who are also now journalists. Turn your pockets inside out….. I can see the detonator wires sticking out… Come off if …. You think I don’t know? Are you joking with us? Next time you do something like this, coordinate it with us. Had we known we wouldn’t have evicted Dawasmeh and Milhem [two West Bank mayors, p. 120]. The entire gang of arrested conspirators served their prison time together and according to Segal, had the status of celebrities in and outside of prison. The long-time Israeli politician and career soldier, Binyamin Ben-Eliezar was mentioned as among their many frequent and admiring visitors (p. 122). Although Segal has claimed that his role in the Underground only involved the bombing of the mayors, and that his participation was marginal, his book gives a completely different impression. In a 2013 interview published in the Israeli daily, Ma’ariv, and quoted below, the journalist/terrorist admitted that Dear Brothers did indeed give the impression that he had a significant role in the Underground, but now says that impression was incorrect. However, it is difficult not to come to the conclusion when reading the book that Segal was, at the very least, an accessory before the fact in the crimes committed. The descriptions of his co-conspirators are glowing and his criticism of their crimes minimal. Any moral qualms are, in the end, justified by invoking the actions of the perceived enemy, the Palestinians. In the interview, almost 30 years after leaving prison, Segal is more restrained, but hardly penitent. Ma’ariv — Do you have any regret today about the Jewish Underground? Haggai Segal — Regret? The word “regret” is not exact. I have another way of looking at it. HS — I said to the judge in court that I will not lie to him, and I won’t behave like some convicted criminal that begs for a pardon or expresses regret. However, from my point of view this was a one-time event. It isn’t something that is appropriate now. M — Then no regret, but are you sorry that you were in the Underground? HS — I wrote a book on the affair, “Dear Brothers.” It apparently magnified retroactively my participation with this group. And the truth is that my participation was marginal. I was involved in one episode, the attack on the mayors, who were evil doers without a doubt. Not exactly an expression of remorse that you would expect from a rehabilitated terrorist, is it? The elder Segal has two sons who are also journalists. The older son, Arnon Segal, is a print journalist. He writes a weekly column about temple activism for the newspaper for which his father serves as editor. He is also a temple mount activist, who is a member of The Headquarters for Temple Movements (Hebrew Facebook page). These temple activists believe that a Jewish temple should be built on the present site of the Dome of the Rock, which is a 1300-year-old mosque, holy to Muslims all over the world. Arnon is a frequent visitor to the al Aqsa plaza, the site of the Dome of the Rock and the al Aqsa Mosque. He conducts “tours” at the site, events that are considered provocative in the extreme by Palestinians. The “tours” often lead to violent confrontations between Palestinian worshippers and the Israeli police who guard the Jewish groups. 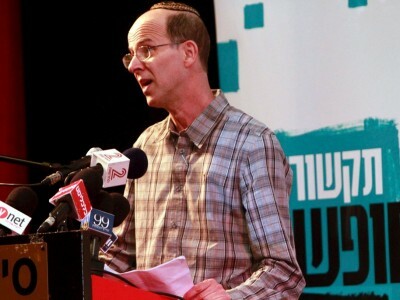 Visits to the plaza by religious Jewish settlers, like Arnon Segal, have been said to be one of the major causes of the current Intifada. Arnon has publicly stated that as a child there was much talk at home about rebuilding the Jewish temple. In other words, Arnon is a chip off the old block, and his insanity is further confirmed by the fact that he wants to sacrifice animals at the temple’s altar as was done in ancient times. He believes that the sacrifices will lead to a time of redemption, at least for himself and his Jewish compatriots. This past July, Haggai Segal was appointed (Hebrew) by the right-wing Israeli Justice Minister, Ayelet Shaked, to a blue ribbon commission which will investigate incitement on the Internet. The purpose of the group, according to Shaked, is to protect public officials from threats and slander while safeguarding the right of the public to free speech. Despite some objections to appointing the elder Segal to the panel, including the resignation of one of the commission member in protest, Segal joined the commission. Edna Arbel, a former Head of the Supreme Court, who is the chairperson of the commission, had also expressed reservations about the Segal appointment, but in the end agreed to his inclusion. Children should not be judged by the sins of their fathers and it is only natural for sons to protect their fathers from hurtful criticism. However, learning about Haggai, Amit and Arnon Segal you can only think the worst of the Jewish-Israeli society which affords the three of them a prominent and respected place in the social order. Who knows? Maybe one day Amiram Ben Uliel,a young religious Israeli settler currently awaiting trial for throwing a bomb into a home in the West Bank village of Duma, will become the Israeli Minister of Communications.